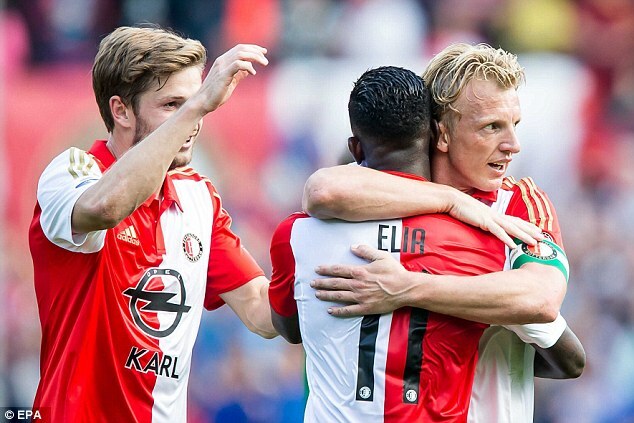 Dutch giant Feyenoord continued their fine form with a 2-0 victory over Roda in an away clash. Struggling side Roda have not won any home game this campaign so they were not expected to cause an upset to high flying Feyenoord. However, they put up a strong fight in the first half of the clash against Giovanni can Bronckhorst side. The first half ended goalless as the Dutch League resumed after a mid-winter break. After the break, the home team almost went ahead but skipper Tom van Hyfte’s effort hit the goal post. Former Liverpool striker Dirk Kuyt – who was recently pictured with Reds’ fans ahead of the game with Chelsea in the Premier League – scored for the visitors in the 69th minute. Eljearo Elia grabbed the second to seal three points for the Eredivisie log leaders. In other games, loanee from Chelsea Lewis Baker was sent off in the clash between Vitesse and FC Twente. The game ended 3-1 after Baker opened scoring – his seventh goal of the season. Ricky van Wolfswinkel and Milot Raschica contributed a goal each while Mateusz Kilch grabbed the consolation through a spot kick. Second-placed Ajax defeated Zwolle 3-1 courtesy of two goals from Hakim Ziyech. Ajax also faced a difficult first half in the hands of their hosts. They got their first goal in the second half as Lasse Schone scored from the penalty spot after Phillippe Sandler fouled. The goal seemed to break the resistance of Zwolle as Ziyech grabbed his first of the game and the second for the Dutch giant. Nicolai Brock-Madsen pulled one back in the 72nd minute but Ziyech scored another ten minutes before the end of regular time. It seemed the home teams were not determined enough as NEC won their away game to Willem II. Jay-Roy Grot 76th minute effort separated both sides.